Dorsing is colouring with oil pastels. If you use the Pergamano trade oils they are called Dorso, but any oil pastel will do. You need to spread the pastel with a medium e.g. dorsoil, lavender oil, almond oil - you get the picture. Fold a piece of kitchen paper to make a point, add a little oil and spread on the parchment paper. Then use the moist kitchen paper and rub a little pastel on to it. Then rub in a circular motion on your parchment. Use a dry part of the kitchen roll to remove excess pastel and buff up. If using more than one colour, apply each colour separately and then blend together. 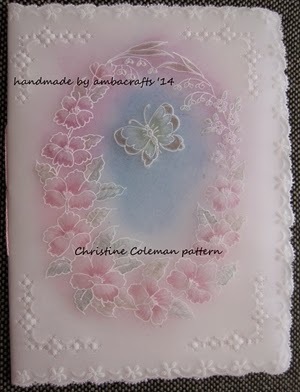 These two cards have been coloured with dorso pastels. Gorgeous work Alison, I absolutely love parchment I can't do it but I love seeing it I think it's so delicate and pretty. Absolutely stunning work. I still have allthe cards you have sent me as I can't bear to part with them especially as Iknow all the hard work that goes into them.